NETWORK FINALS: AGENT CARTER gained 0.1 in final numbers. Also, IZOMBIE held onto this morning’s 0.6, a feat it didn’t manage last week. CABLE HIGHLIGHTS: FX’s PEOPLE VS OJ SIMPSON remained fairly steady at the top of Tuesday cable, down 0.07 to 1.28. HGTV’s FIXER UPPER gained 0.05 to 0.97, but HOUSE HUNTERS INTL fell 0.07 to 0.42. OWN’s HAVES AND HAVE NOTS ticked down to 0.79. On Bravo, REAL HOUSEWIVES OF BEVERLY HILLS fell 0.08 to 0.67, and the season finale of GIRLFRIENDS GUIDE TO DIVORCE edged up 0.02 to 0.29. Discovery’s MOONSHINERS fell 0.11 to 0.65. On Freeform, PRETTY LITTLE LIARS lost a tenth to 0.59 (and was down 0.28 in its target F12-34 demo, although it was still the night’s strongest show in that demo at 1.34), and SHADOWHUNTERS fell 0.06 to 0.37. A&E’s MARRIED AT FIRST SIGHT rose a tenth to 0.59, but FIT TO FAT TO FIT shed a hundredth to 0.30. 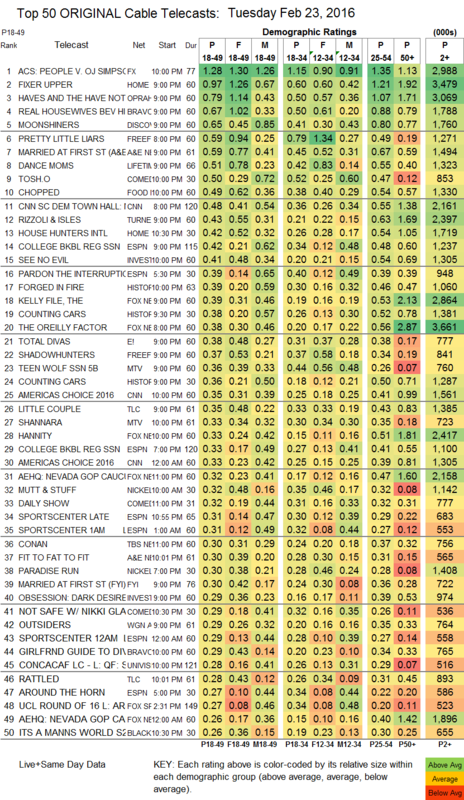 On Lifetime, DANCE MOMS lost 0.04 to 0.51, and PITCH SLAPPED dropped 0.05 to 0.19. Comedy Central’s TOSH.0 rose 0.07 to 0.50, and NOT SAFE WITH NIKKI GLASER climbed 0.02 to 0.29. Food Network’s CHOPPED gained 0.08 to 0.49. CNN’s DEMOCRATIC TOWN HALL, at 0.48, topped its coverage of the REPUBLICAN NEVADA CAUCUS at 0.35. TNT’s RIZZOLI & ISLES rose 0.02 to 0.43. 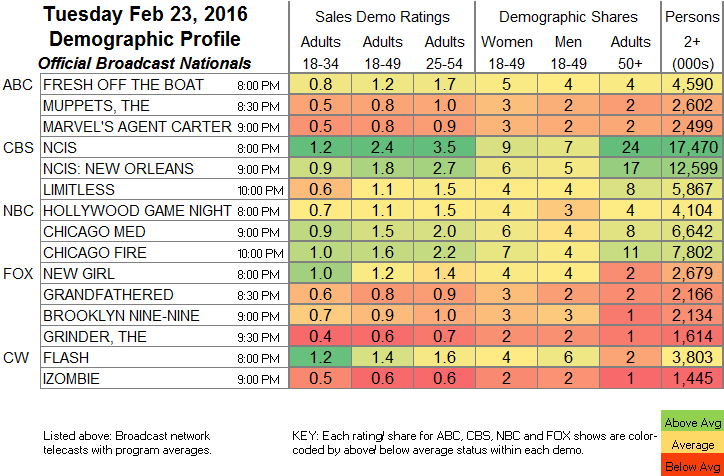 History’s FORGED IN FIRE fell 0.05 to 0.39, and COUNTING CARS dropped 0.13 to 0.38. On E!, TOTAL DIVAS ticked down to 0.38, and JUST JILLIAN was down 0.03 to 0.18. On MTV, TEEN WOLF dropped 0.06 to 0.36, and THE SHANNARA CHRONICLES gained a hundredth to 0.33. TLC’s THE LITTLE COUPLE climbed 0.02 to 0.35, and RATTLED found an extra 0.01 to 0.28. OUTSIDERS (WGNA) ticked down to 0.29. BET’s IT’S A MANN’S WORLD was at 0.23/0.26, around the same level as last week’s ZOE EVER AFTER, following a special CELEBRATION OF HOLLYWOOD at 0.18. Pop’s IMPACT WRESTLING fell 0.04 to 0.06/210K, with the re-airing at 0.03/87K.